I was checking out the hotel where we will be staying. This is something of a far cry from my original thoughts about Operation Smile missions. Obviously, there will still be missions where we will be sleeping rough, or at least not in any luxury, but this time we will be staying in a hotel that lays claim to five-star status. Unfortunately, their website manages to combine the looks of a cosmopolitan hotel with the quaint use and misuse of English that is fast becoming a web favourite. Have a look at the picture: Note they are happy angles… Does that mean that they are more than 90 degrees or is that acute? My maths was never that good. I can’t wait to try the “import red wind” – although my wife has been known to comment on the subject of “wind” after I have eaten too many onions, she doesn’t usually refer to the actual colour. Yum, yum… I can’t wait. News from China is very much on my mind at the moment. The Olympics started with a huge song and dance and a Singapore swimmer came within an ace of winning the first Olympic medal for decades, the Singapore table-tennis team have just secured at least a silver medal and the coverage dominates the front page of the Straits Times every day. However, Olympic glory is pushed to one side as I search for the headlines that read “Renewed Violence in West China” (BBC Online 14/08/2008). As I write this I’m reading about how more people have been killed in a stabbing attack by presumed Uighur Muslim separatists/terrorists. The latest attack comes after a string of attacks launched since the Olympics began, and they are all in Xin Jiang – the province that is just about to become my first experience of China. The practical side of me says that things are not going to be too bad – I went to Northern Ireland in the midst of the “Troubles” and I regularly cross the road without dying (something that is more likely to cause you death and injury than terrorists). On the other hand in Urumqi (the main city) where we will be I’m guessing that I will stand out from the crowd and it’s not unknown for terrorists to target westerners to get more attention. An email from the Operation Smile (known from now on as OS) co-coordinator reads: “Ulumqi is safe. However, travel outside of Ulumqi for sightseeing is not advisable due to the security concerns.” So, I don’t know how much I’ll be able to see other than the hotel and the hospital. Actually, though, my main concern was that my wife didn’t read the papers and put two and two together. Until yesterday she hadn’t appeared to have done so, but unfortunately someone mentioned it to her yesterday and now the cat is out of the bag. I really don’t want her to worry, so I’ll have to spend some time on Skype and SMS to reassure her. (Just a note about names in the rest of this journal: Jesta is, of course, a pseudonym, and other people who feature will be referred to by their initials. 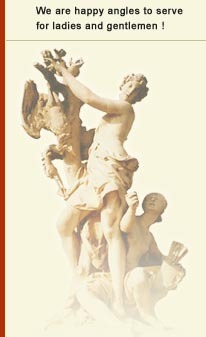 This is not for reasons of secrecy, but simply because it is better to be more private than less). It is with a rather zonked state of mind that I address you today. I haven’t slept all night. I started working on GGF last night at 10:30 pm and didn’t stop until 7:30 am, when I decided to go stun myself awake with a cold shower. Another hour to neaten it up before I get ready to start my day with a morning meeting, and then an afternoon meeting, an evening event and a night engagement. I see mushrooms dancing in my peripheral vision. GGF is zonked out her mind! Hurray. Fable II Pub Games is out! Too Human is too popular! Win a cool Friendster thumbdrive!! Oh, gosh. It takes freaking forever to make videos. But here’s a video of me explaining the gameplay in Braid. I love this game. I’ll talk a little about it in case you don’t like to watch videos. 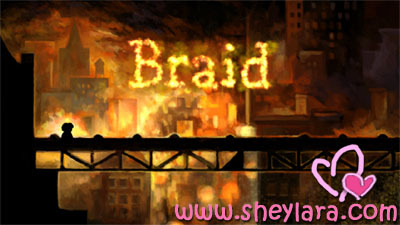 So, Braid is an Xbox LIVE Arcade game which you can download for a small fee. It looks like a 2D platformer, but it’s actually a puzzle game. You can die but you won’t die. That is, when you get eaten by monsters, you can rewind to when you haven’t gotten eaten, and then continue from there and try not to get eaten again. Running around the world and not dying, you collect jigsaw puzzle pieces to make nice pictures. The pieces are scattered around the world and they just annoy the heck out of you because you can see them but you can’t get at them. You have to really crack your brain in this game. And then crack it somemore. Until your brain hates you. But I like the music, the graphics and the gameplay. It’s unique and refreshing. If you like abusing your brain and stomping on monsters’ heads, get it. That’s right. This is the arcade mini game thingy which you can play now to earn gold for the Fable II game that’s coming in October. Here’s a boring video I took of it. Well, watch it if you want to see what the mini games look like. There are three gambling games and you’re given 500 gold to start off with. If you lose it all and go into debt, you’re in trouble when you start Fable II. It’s freaking hard to win money. I’ve already lost like 300 gold. Haha. Oh, well. Have never been good at gambling, anyway. But I like the games. 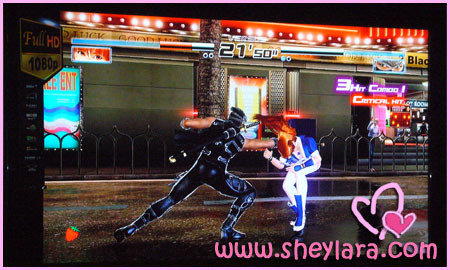 The graphics and sound effects are really cool! I mentioned last week that Bryan De Silva from RazorTV interviewed me for a segment. The video is out! We did an interview and then we played Guitar Hero 3. Bryan made funny faces. IT’S ALL IN THE VIDEO. And I made victory poses. On Saturday, I went to WCG again because the Xbox ambassador had to make an appearance and tell everyone to subscribe to Xbox LIVE. We did that on the main stage of WCG. Offstage, I played several matches of Project Gotham Racing 4 with Xbox fans. Which I sucked at. But it was fun. And no one booed me, nice chaps, all. I received a record number of entries for last week’s Too Human giveaway. There were 46 entrants. Wow. Didn’t know this game was so popular! You know what… I’ve got the game in my hands already! Mwahaha! I got two copies on Tuesday but, get a load of this, I haven’t had time since then to even open the box to kiss the disc. In any case, I can’t publish a review of it yet because the game hasn’t officially launched and I don’t want Silicon Knights coming after me. So… WHO IS THE LUCKY WINNER OF A BRAND NEW COPY OF TOO HUMAN? Congratulations!!!!! You are very lucky because you’ll be playing Too Human two days before the rest of Singapore (that is, assuming you live in Singapore)!!! The USA launch is Aug 19 while Singapore stores will only stock it on Aug 21. But I’m allowed to give it away on the 19th, so you’ll be getting it on that day if we can arrange a meetup. Will be contacting you via e-mail! Please thank the Singapore Xbox Team for your prize! The rest of you who didn’t win, don’t be too disappointed. There will be more giveaways in the future! I have a modified Japanese Wii set that appears to be fully-bricked. Can it be fixed like a semi-brick Wii set by inserting a Japanese game with a firmware update that is higher than my Wii version? If it can be corrected, where can I buy a Japanese game in the US? I’m afraid I have bad news for you. There is currently no fix for a fully bricked Wii. Well, that’s actually why they called it a “brick” in the first place. Sorry, pal. Do you have any idea where to download drivers for Xbox joysticks to use on the PC? I didn’t actually answer this question for Chak because he answered it himself before I could do it, lol. But I’m posting it here anyway in case anyone ever wants to ask the same question. You can download the driver here. Er… please don’t ask. If I tell you, I’ll have to kill you. No, actually, ask me in a year’s time. That will give me time to, uh, actually have a number to tell you. The sad part is that it has a capacity of only 500MB. But the happy part is that it’s one of those thingamajigs you can take and show off to your friends and piss them off because they can’t buy one even if they had money. Unless you sold it to them at a very high price, in which case, you should share some of that doosh with me, okay? Yes, same old same old. Post a comment saying you want it before next Friday! And now… PLEASE GO READ MY XBOX BLOG. I mean, like, regularly. It’s very lonely. Recently, a reader got in contact with me after reading my post about cleft lip babies and how we can help them. A recent scan of her unborn child had shown him to have a cleft palate. Her gynaecologist wasn’t able to offer her the guidance she needed, so I connected her with Jesta, a fellow cleft parent who is also a volunteer with Operation Smile Singapore and KK Hospital’s Cleft and Craniofacial Centre. She now has the support she needs and has decided to keep her baby. It warms my heart that there are organisations in Singapore actively reaching out to help parents and patients in need. Next week, Operation Smile Singapore will be undertaking its first major Asian mission to reach out to patients in more needy parts of the world. On Aug 20, a mission group will be going to Urumqi, Xin Jiang, China, to operate on 75 children to repair their cleft lip and palates. The surgical part of the mission is expected to last a week — three days of surgery and four days of post-operative care and training. For the coming mission to Urumqi, Jesta has been accepted as a volunteer photographer with the mission and will be using the pictures he takes for Operation Smile Singapore’s stock library and a photography exhibition for the Singapore Biennale. I’m also very pleased to announce that Jesta will be guest blogging on Sheylara.com about his trip, internet connection permitting. These mission trips to help children are made possible by public donations. If you wish to help, you can donate directly to Operation Smile Singapore. And I wish the mission team to Urumqi safety and success. Much has already been said about Royston Tan’s 12 LOTUS. Some bombs but mostly raves. Me, I’m a raver. I loved the movie so much I couldn’t write a review of it immediately after watching it. I had to go in search of clamps to close my jaws back. I don’t even know how to start saying it. Almost everything about the movie is good. 12 LOTUS is thankfully nothing like 881, Royston’s previous film. It is miles better. It is more than miles better. Now, the danger in having me review the movie is that I won’t be able to stop gushing like a giggly teenager, especially since Qi Yiwu is looking better with every film he makes. So I decided to make the Goonfather do the job. Haha. He’s getting to watch a lot of free movies through me, so I need to make him work a bit. I managed to sit him down for 10 minutes to interview him on his thoughts about the movie. What do you think of 12 LOTUS? I think it’s not too bad. There are 12 lotuses, not 7 lotuses, not 6 lotuses. 12 is a great number for lotus. At first, I thought it was a movie about 12 ah lians forming a gang. You know how secret societies and gangs like to play with numbers? So it’s like 12 ah lians. But it turned out to be a song with 12 chapters, and each chapter of the song represents a part of the character’s life. What kind of movie would you say 12 LOTUS is? It’s a drama. Maybe almost like a docudrama because it gives you an insight into a getai singer’s life. It shows you how people live their lives based on their different circumstances. And it’s interesting because those are lives I’ve never been through before. So you liked the movie? The songs were great. The filming was good, compared to Money No Enough 2, which looks like it was filmed by some cheap handycam running around the streets. But 12 LOTUS was a bit grainy for my liking cos I’m a high definition guy. I think grainy movies look better. I hate high def. It looks fake and plastic. Nooooo. Everyone should switch to HD. That’s the only way to go. Never mind. Did you like the musical format of 12 LOTUS? It’s something unique which I didn’t expect from a locally produced movie. So, does that mean you like it or not? Yes, Mindee Ong is very cute. What has that got to do with what we were talking about?? Okay, okay. 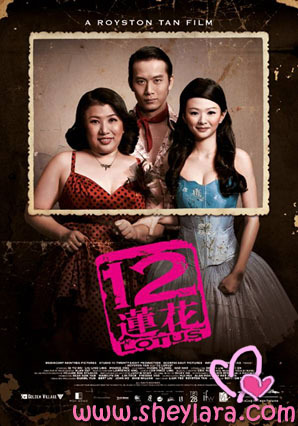 12 LOTUS is a Singapore movie like never before. It’s a Singapore musical. And it’s like Greased Lightning meets Taiwanese drama. It’s a Singapore produced Hokkien musical, so it’s very saat, okay? What about other aspects of the movie? The staging is nice. The costumes were hilarious, especially the feather guy. Did you like that it was dominated by Hokkien speech? HEY! I CAN’T PUT THAT IN MY BLOG!! Okay, okay. My favourite part of the movie was that they managed to get a few packets of Kaka as props. It’s damn cool okay! I’m impressed with the director! Oh, but they were not able to get the bird series $50. They were using the Yusof Ishak $50 in the movie. What would you say to someone if you’re trying to convince him to watch the movie? Watch the show. If not I dowan to talk to you. Haha, no. 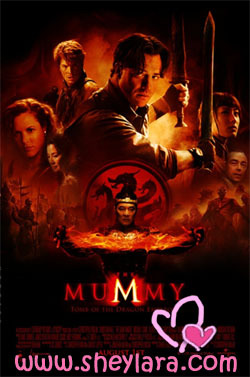 I would say 12 LOTUS is better than The Mummy: Tomb of the Dragon Emperor. That’s a totally different genre lah! You can’t compare apples with oranges. Yah, but I’m saying it’s a better movie than a supposed Hollywood blockbuster. Don’t waste your money watching The Mummy. Watch 12 LOTUS instead. More worth it. Can you compare with something more relevant or not? Okay, it’s better than High School Musical and Hairspray. Those are musicals. Can right? Why is it better than those two movies? High School Musical because I slept through it. Hairspray because it’s not realistic, it’s a fairytale. 12 LOTUS is a realistic insight into the lives of very real people. So how many stars would you give it? 4 or 5 (out of 5). For a guy who is usually very opinionated and would talk your ears off if given half the chance, the Goonfather sure hates being interviewed or being asked his opinions. Next time I feel like interviewing him, I should just say, “Don’t tell me about such and such,” and then have a tape recorder rolling in secret. But go watch 12 LOTUS if you have a chance. It will leave you beautifully haunted.